Two weeks ago I made a post about how Tree Swallows were nesting in one of the boxes, there's been a big of a change to that. First of all there are no longer any birds occupying the box that the Tree Swallows were first in, they moved into another one of our boxes across the field. I was able to get very, very close to the pair and got amazing pictures. The swallow barely fit into the frame. Tree Swallow, this one isn't very blue. Here's the other swallow, a lot more colourful. What's strange is that it looks as if we have a pair of Tree Swallows nesting in the kestrel box! I've heard that bluebirds can nest in kestrel boxes but not Tree Swallows! Thanks to Prairie Birder for her Feathers of Friday prompt. For fun and maybe for eggs, our family is hatching chickens. It is also very educational. We got eggs from our friends and have had them in an incubator for a couple weeks. For the last few days we have seen them wiggling and heard them chirping, but just this morning a few broke through the shell. Two have fully hatched so far! An egg starting to hatch. The two that have hatched are Bareneck chickens. It's a breed where the necks are featherless. Thanks to Prairie Birder for the Feathers on Friday prompt. Stay tuned! I'll be making a post about them when they all hatch! If you would like to join me for my W.W.B.W. leave a guess in the comments or make your own weekly what bird post. No one guessed last weeks, Wilson's Snipe! This is the second part of the Oak Hammock Marsh Birding with Christian Artuso. See the first part here. We were hoping to see some early shorebirds. I spotted a Greater Yellowlegs and was able to identify it by myself. We also saw two American Avecots feeding by the shore. We got some really good pictures. We saw quite a bit of waterfowl. American Coots, Northern Pintails, Mallards, Northern Shovelers, we even saw a Greater Scaup, which was a lifer for me. Some other birds that we saw were Franklin's Gulls, Double Crested Cormorants, and two Snow Geese. Red-winged Blackbirds are excellent photo subjects, so I have included plenty of pictures. Red-winged Blackbird waiting for the ice to melt. I got this shot of it flying, the brilliant red makes them a bird worth seeing. We were able to get really close to one. As we walked back to the car on the trails we saw a Muskrat, which I don't remember ever seeing. I like birds but I really like mammals too. We saw some Tree Swallows in the parking lot and I got some decent pictures. On the drive back we stopped at the Red-tailed Hawk nest by Lockport we had found a couple weeks before. We were looking at the nest, we couldn't tell if there was a head sticking out. When we set up the spotting scope we could see a head. The hawk flew away and I managed to get this picture. That concludes the Oak Hammock Marsh Birding series. Thank you Christian for taking us out once again!! Okay, I am finally getting to write these posts. I just haven't got to it the past couple weeks. I am doing it in two different parts because I got so many fabulous photo's I don't want to leave out of my blog. Christian arrived at our house at 7:30, and we set out to Oak Hammock Marsh. We stopped in Lockport on the way to see if there were any pelicans on the river. We were in luck, three pelicans were swimming right by the bank. We got some really good pictures that I am really happy with. We continued the drive to the marsh, but after we spotted a pair of merlins we stopped to take some pictures. I got a good shot of it flying. On the Oak Hammock Marsh road we saw lots of Killdeer and a Pied-billed Grebe. I really like these water birds. We also saw a Vesper's Sparrow, which is a lifer and a Savannah Sparrow which is a yearer. Here's a photo of some of the Killdeer. Eventually, after we got superb photos, it scampered down it's hole. Stay tuned for the next part!! Yesterday I saw the first Tree Swallow go into our boxes. Last year it was exactly the same date, May 15th. Thanks to Prairie Birder for her FoF prompt. Prairie Birder guessed last weeks correctly, Lincoln's Sparrow! Yay! Today we saw one of my favorite birds! 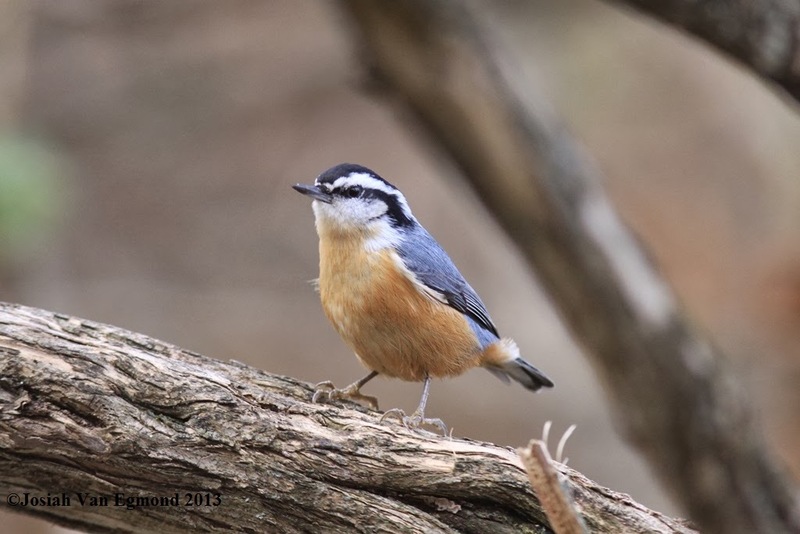 A Red-breasted Nuthatch! As you should know, we used to have a Red-breasted Nuthatch around our feeders all the time that we named Strip. But when we came home from our Ontario trip last summer he was gone. Strip was the only bird that would eat off our hands. Strip on my hand a year or two ago. I actually don't know if this Red-breasted Nuthatch is the real Strip, but we're going to call him that! I got some good pictures of him this morning. I'll try and see if it will eat off my hands sometime. We did see some Red-breasted Nuthatches in Ontario, so it is not a new yearer. Christian said we may not see them here until the winter, but I guess he was wrong. These little birds are so cute as they creep up and down the trees. I hope it stays all summer and winter long. Here is the picture I got this morning. Here he is, so cute. Seeing a Clay-colored Sparrow, a Barn Swallow and hearing a Great Crested Flycatcher today put me past 100 species this year. I am at 102 sp. I am very impressed that I already have that many. I'd like to thank Christian Artuso for taking me on an 'Owl Prowl' and taking me to Oak Hammock Marsh recently, (blog post to come, be patient) that helped me on boosting my year list as well as my life list. Going to Ontario also helped start off my year list. I'd love a comment from you saying how many species you've seen this year. Another thing. I will be making a change to my life list. It says I have 162 sp., but I will be lowering it to 147 sp. You might be wondering why I am doing this, because quite a few of the species I don't actually remember seeing, like the ones from Assateague Island in 2009. I wasn't interested in birds then and didn't pay attention to them, so I don't remember them. I have compiled a life list with dates that I got from ebird checklists and picture dates. I don't have the exact date for all of them so I guess best I could for some of them. Thanks to Prairie Birder for the FoF prompt. Alright, can you guess this bird? Everyone got last weeks right! Song Sparrow! This will be my final part, even though I would like to do many more because I have so many pictures. On one bike ride with my brother, we saw a Red-tailed Hawk, it landed on a sign across the road. We took turns taking pictures of it. I had the camera when it launched into the air and flew right over us. A few types of sparrows have showed up. We aren't lacking an amount of Fox Sparrows! White-throated Sparrow started to show up about a week ago. We have been seeing Goldfinches in the winter and spring already, but this is the first almost full summer plumage one! Like every year, Ruby-crowned Kinglets are common. I love these tiny birds! Golden-crowned Kinglets are also fairly common here. Me and my brother got really close to one and we both got really good pictures, He may have got the best one though, here it is. Finally the yellow-rumps started to show up! I love there striking plumage. We have also been seeing quite a few Brown Creepers. They are fairly friendly birds and we were able to get really close to them. And that concludes my 'Spring has Sprung' series. Of course that doesn't mean I won't make any more posts about spring birds, so stay tuned, and happy birding!